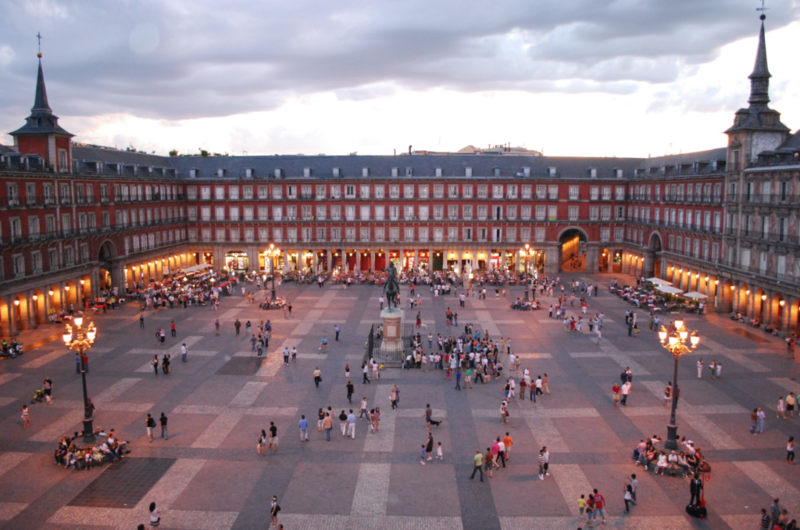 Madrid has become an increasingly popular destination over the years, receiving visitors from all over the world. The capital of Spain, once neglected by tourists — or at least not as frequented as Barcelona — has now become a favorite among European cities for travelers. As it usually happens when the number of visitors rises, most of the top sites and places to eat and drink in Madrid have become rather touristy, which is why here you will find an off-route guide that will let you discover the city from a different angle. There is a neighborhood in Madrid that goes by the name of Las Letras, as it is devoted to the country’s most famous writers; many of which lived and died in this part of the city. If you walk across its narrow streets, you will bump into quotes written on the floor that were taken from the most famous works of masters such as Quevedo, Echegaray or Lope de Vega, not to mention Miguel de Cervantes, who actually lived around the area. The Barrio de Las Letras also hosts innumerable restaurants and bars which serve some of the capital’s best cañas (small beer) and tapas. Visit Cervecería Cervantes and La Daniela for a true taste of Madrid. Although the art triangle is around this area (encompassing Museo Nacional del Prado, Museo Reina Sofía and Thyssen-Bornemisza), you are likely to find long lines of people trying to get in. So, if you don’t want to wait, head towards Plaza de Colón to visit alternative cultural centers. The National Library, for example, is an amazing building that hosts rare copies of some of the most important literary works of Spain, including “The Book of Games” by Alfonso X, not to mention some unique editions of “Don Quixote De La Mancha”. From time to time, the library also hosts temporary exhibits. Around the corner, you can also head to the National Archaeological Museum and later visit the Casa Árabe and eat at its lovely restaurant Shukran, which serves delicious oriental dishes. At the end of this cultural route, you can skip the Buen Retiro Park and visit the Campo del Moro Gardens instead, which are strategically located behind the Royal Palace of Madrid. Not many know about this hidden gem where you can enjoy a walk in an aristocratic atmosphere while spotting Indian peafowls, ducks and other birds. Autumn is a particularly good time to enjoy a stroll around these gardens while reliving the splendorous years of the Spanish capital. Just 20 minutes away, you can visit the Matadero, which is a former slaughterhouse now turned into a cultural center where visitors can go to a concert, an exhibition or the theater. Madrid offers many off-the-beaten-path activities in addition to the more popular ones, which are also worthwhile. But like most big cities, it takes more than one trip to get to really know them. So, the next time you plan to go to the Spanish capital, head toward these less famous spots to enjoy the city from a new angle while digging into its history, culture and gastronomy.